Welcome! We hope that you enjoy reading about our Yurok Redwood Plank House. If you like, you can also view photos of the plank house details and construction as well as museum displays. Thanks so much for visiting. 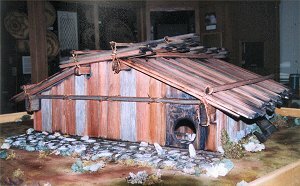 Please continue through the rest of this website to learn more about Plank Houses and Yurok culture. Redwood or Cedar Plank Houses were built by many North Coast tribes up to and through most of the 19th century. Typically the houses were approximately 20 feet by 20 feet not including the roof overhang. The planks were either split from naturally fallen trees or removed from large trees, allowing the tree to heal and remain alive. The center section of the roof had moveable planks to allow for adaptation to varying climatic conditions. It also served as an outlet for the smoke generated from the fire below in the center of the pit. The pit was dug into the earth approximately 4 feet and it is where the family lived - cooking, sleeping and the rest of a family's indoor activities took place here. In Yurok culture, the men did not sleep in these family houses. They, instead, spent their nights in sweat houses. We plan on building a limited number of sweat houses in various scales soon. We use traditional material to build our models. Reclaimed very fine-grained old growth redwood is used throughout. Our first models were built from old growth split rail fencing while current models are constructed from leftover old-growth used to build Sumeg Village. The wild grapevines used in the model are gathered at Weitchpec at the confluence of the Klamath and Trinity rivers. The stones for the front porch area and those used to support the bottom of the planks around the perimeter of the plank house are gathered from the rivers and beaches of the North Coast. This model is fully landscaped. It is most important that our plank houses are as close to the original as possible. To this end, we researched photographic archives and made many trips to Sumeg Village at Patrick's Point State Park, North of Trinidad, California and other locations to take measurements, photographs and detailed drawings. Sumeg Village is a replica of a Yurok town that was built by Yurok tribal members in the 1980s. We also relied heavily on the knowledge, input and feedback of local tribal people. All of our models are crafted from reclaimed/recycled old growth redwood. Note that what we have created is a scale model of a typical Yurok Redwood Plank House. The model is 1/6th scale -- every 1 inch in the model represents 6 inches in the full size houses. Our model represents a full size house of 20 feet by 20 feet. This house is similar to, but not exactly the same as homes built by Wiyot, Hupa, Karuk, Tolowa and other North Coast Native Americans. The project could not have been completed without the friendship, knowledge and craftsmanship of many. Ernie Albers helped build the plank houses and acted as cultural advisor. Ernie is of both Yurok and Karuk descent and is a member of the Yurok Tribe. Ernie and Mike travelled to Weitchpec to gather grapevine used in the construction of plank houses to assure that our models were as close to the original as possible. We also visited Sumeg Village in Patrick's Point State Park to carefully measure the plank houses there. Dale Ann Frye Sherman is the curator of the Nealis Hall at the Clarke Memorial Museum in Eureka, California. This project would not have happened if Dale Ann had not contracted with us to build the exhibit in the first place. Dale Ann coaxed us along and helped us with the cultural aspects of the project in many ways. Dale Ann also works as a cultural design consultant to architectural firms who design buildings for various Native American institutions and tribes. Her most recent work is the United Indian Health Service' Potawot Health Village in Arcata, California (Click here for photos). Dale Ann is of Yurok, Tolowa, Hupa and Karuk descent and spent her childhood and early adult life living on the Klamath River. Dale Ann also teaches in the Native American Studies Department at Humboldt State University. Marlon Sherman first spotted the material that we used for our plank house while we were rummaging through the piles of wood at a recycled lumber yard on Humboldt Bay. The old growth Redwood split rail fencing that Marlon found became the beams, walls and roof material of our first plank house. Marlon and I spent many hours at Sumeg Village photographing and measuring, and many more discussing the various aspects of the project. Marlon teaches in the Native American Studies program at Humboldt State University. Marlon is Lakota and spent his younger years living on the Pine Ridge Reservation in South Dakota. He is married to Dale Ann and has spent most of his adult life on the North Coast. Marlon is now a fulltime professor of Native American Studies at Humboldt State University where he teaches classes such as The Indian In American History, Tribal Water Rights and Native American Film. 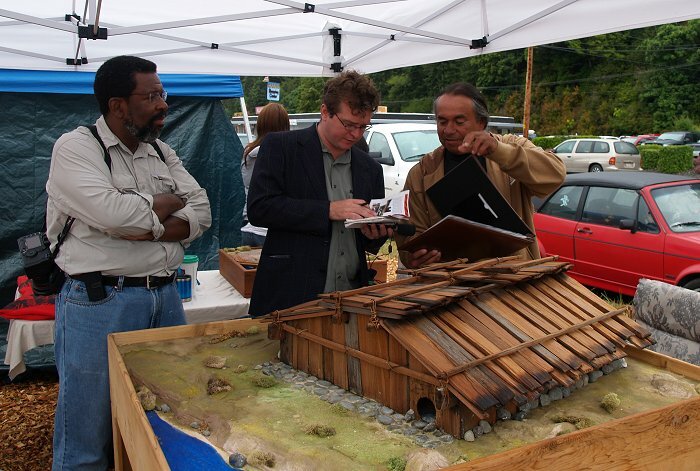 Mike Meuser has crafted wood and built scale models most all of his adult life. In college, Mike earned degrees in Environmental Studies and Sociology. Doing the plank houses combines his loves of environmental history, environmental justice and scale woodworking. Mike also founded and maintains MapCruzin.com a website devoted to "helping democratize the production and consumption of information and knowledge" and Learn2Map.com. Each of us takes an active part in the research, design, creation and marketing of the plank houses. Many thanks too, to all for your help, care and inspiration. Our services and products range from historical and on-site research through exacting scale model and full-size building to complete display project creation and management. We also provide indigenous architectural consulting and, in some cases, plans and kits. If you are interested in a museum quality scale model or fully developed exhibit or any of our related services, or just want to talk, please contact us. We look forward to hearing from you.